Ted Murphy looks at a soda can and sees an opportunity for people to make money. And not by returning the empties to collect a nickel. Instead, the CEO of IZEA sees people snapping photos of their beverages with their iPhones and collecting points through his new program WeRewards. “You take a picture of yourself with the product, and you earn points,” Murphy tells FastCompany.com. “It’s almost like an instant coupon.” But the points can add up to equal cold, hard cash. He sees partners flocking to the service as a way to get physical products in the hands of real live people. “They are paying for the customer coming in and buying.” If WeRewards users share the pic on social media, well that’s just gravy. Putting the focus on the physical experience even allows WeRewards to dodge Twitter’s latest attempt squelch third-party advertisers. “We reward doesn’t have any compensation tied to a share so it is not like you are getting paid to tweet,” Murphy says (unlike his other business, Sponsored Tweets, which changed its model following Twitter’s new tweak). Launching today, WeRewards tapped location-based technologies and social media platforms to spawn a hybrid ad model that aims to transform the way we use the Internet. Harnessing some of the same principles, Loopt, Scvngr, and Foursquare all have similar rewards programs or are about to launch them. Never mind the discovery and sharing online. The future of the Web — at least a big slice of it — is physical. And these companies are ready to start the transformation. Although he’s mum on specifics, it sounds like Altman could be referencing a virtual “sandwich card,” of sorts, which would give major-ish restaurants and retailers an opportunity to reward users for frequent check-ins, and then broadcast those rewards to their friends in hopes they do the same. If true, it’s an intriguing–and encouraging–strategy, though its success will hinge on the types of partners it can secure. Foursquare recently announced a tool for businesses to check customer stats and employee interaction with customers on social media. Starbucks happily jumped on that bandwagon to gather customer feedback and offers rewards and a “barista” badge to frequent buyers. For his part, Murphy’s already snagged Domino’s as a sponsor and has 15 million businesses ready to take check-ins at launch. But WeRewards is a bit different. “The way we look at the space is more as one of sponsored action. The location-based function is part of it but we see a huge opportunity in the area of tasks.” In other words, WeRewards will offer points for check-ins, but really wants to get folks snapping up consumer packaged goods – with photos to prove it. Like Scvngr, a Google ventures-backed, location based gaming company that gives users a variety of “challenges” they must complete to collect points, WeRewards is offering a way to do something more fun than just check-in. 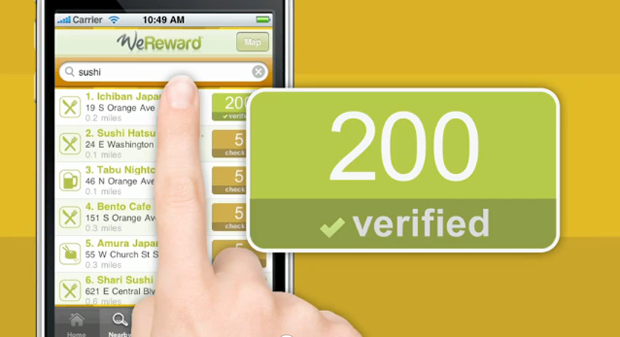 WeRewards works via an iTunes app and links to a user’s social media accounts such as Twitter, Facebook and Foursquare. It also requires a PayPal account to cash in rewards. There’s no complex metric for points, it’s one penny per no matter what the task or where the check-in. The business gets to decide how many points it will offer per task. At this point Murphy demonstrates by bringing up on a virtual meeting screen, a photo of a woman brandishing chopsticks, sitting at a restaurant with a plate piled high with sushi rolls and a comment she tweeted about her predeliction for coating them in soy sauce. On another side of the page are other stats such as how many points she’s collected. The secret sauce, if you will, in Murphy’s strategy is the verification. In a sense, he’s playing to both the consumer and the advertiser by offering concrete rewards to each. The business buying into the program sets the budget. If a promotion underperforms, the business only pays for the clicks they got. However, go over and you still get exactly what you paid for and not a penny more. “It all comes down to what you will do to get an actual paying customer into your business,” insists Murphy, and with a photo of a product, or a receipt for a meal, they business can see exactly what the customer is spending, and calculate its ROI immediately. “All other platforms are based on discounting,” Murphy asserts, “so as a business I’ve got to figure out the value and track that back.” This, he says, is a frustrating enterprise for many still trying to figure out how much to invest on a social media budget. Murphy’s philosophical on this point, “Education is the hard part, I have no doubt it will happen. The key is people are spending more on handheld devices,” but in the meantime he’s got a leg up with with launch partner Domino’s.